Cardamom is a perennial reedlike herb native to Asia and southern India. Like its close relative ginger, cardamom is is well known for relief of nausea. As an after dinner tea it sweetens the breath and aids digestion. 694 It is also one of the favorite teas of pregnant women everywhere who suffer from morning sickness. Cardamom also can help clear congestion from colds, flu and allergies. Cardamom tea is warm, fragrant and a joy to the taste buds as well as the soul. 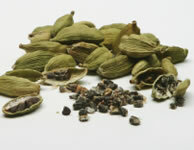 Cardamom is an incredibly rich yet light aromatic spice that reminds you of cinnamon, but has its own unique ambiance. Recipe Instructions: Herbal Tea :Cardamom powder quickly loses the aromatic oils that give this spice it's potency. Purchase either whole pods or seeds for best flavor. Use a mortar and pestle to bruise the pods slightly, then remove the outer pods and grind the seeds coarsely for tea or into a powder for baked goods. Cardamom blends well with other spices such as ginger, cloves and cinnamon. Use 1 teaspoon of seeds per 1 cup of water for tea. Digestion : Poor digestion, gas and bloating affect us all, and there are plenty of good herbal home remedies that help occasional heartburn. IBS :Irritable bowel syndrome (IBS), is a debilitating disorder of the intestines that comes with abdominal pain, cramps,gas and bloating, and irregular bowel movements. Nausea :Use these simple remedies for quick relief of nausea, nervous stomach, motion sickness, morning sickness and quell nausea of all types. Pregnancy/Childbirth :The herbs used for pregnancy are the same herbs that have been used by midwives for centuries.